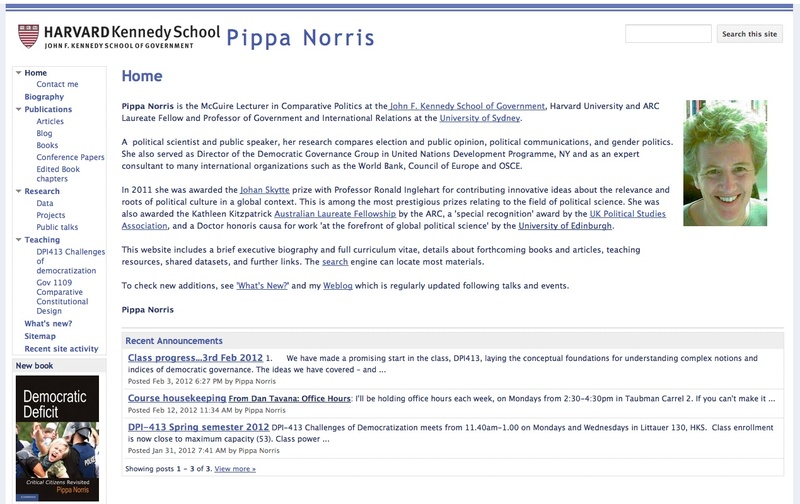 Pippa Norris is McGuire Lecturer in Comparative Politics at the John F. Kennedy School of Government, Harvard University. Her research focuses on elections and public opinion, political communications and gender politics. This free access website provides info about the scholar research, speaking engagements and details about her scientific works. Her entire personal production, including forthcoming books and articles, is retrievable and mostly ready to be downloaded. Full-text versions in pdf format are organized by type and topic, as well as draft versions of authored books and her contributions to edited ones. Current year’s class syllabi and course notes, as well as further resource links are also provided. Another remarkable source are the several rich “shared datasets”, especially focused on elections and constituencies and fully downloadable in pdf or excel format. Featuring a very simple outline and monthly updates, this site is mostly aimed at PS scholars and others already familiar with Norris’ research.